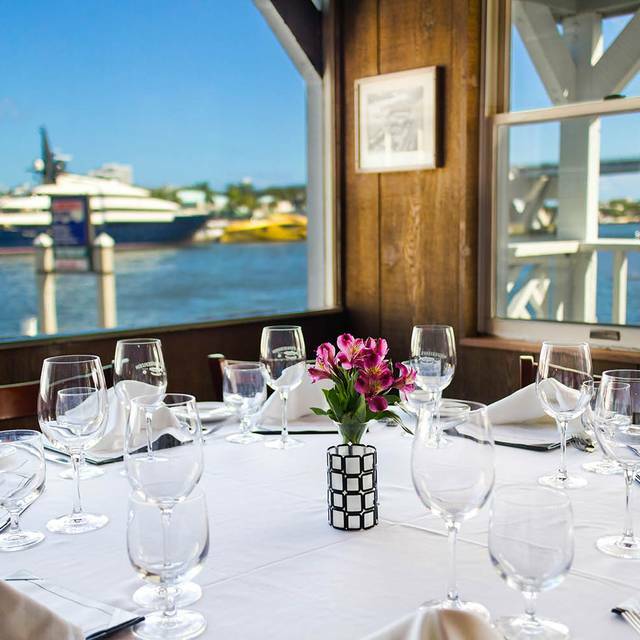 15th Street Fisheries Restaurant (upstairs dining room) opens for dinner nightly from 5:00pm, serving until 9:30pm (Monday through Thursday), until 10:00pm on Friday and Saturday, and until 9:00pm on Sunday. Reservations are accepted for upstairs dinner only. Fisheries Dockside (downstairs) is open for casual lunch and dinner serving from 11:30am until 10:00pm Sunday through Thursday, and until 11:00pm on Friday and Saturday. No reservations are accepted for downstairs dining. Complimentary Valet or Self Parking is always available. Want to arrive by boat? 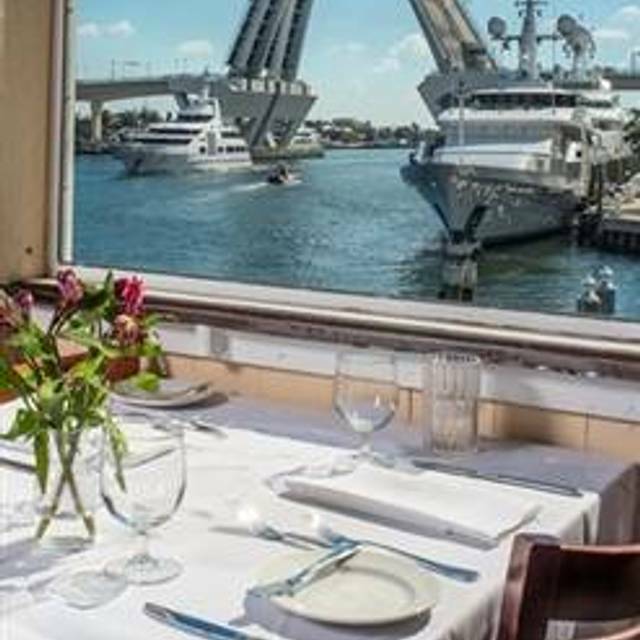 Free dockage is available for vessels from 25' to 100' for restaurant customers. For larger boats, please call ahead to the marina dock store at 954-523-8507. Come watch the feeding of giant tarpon fish, some as long as 6 feet! Purchase a bag of shrimp at the marina's dockstore to hand feed the many fish which live below our docks! 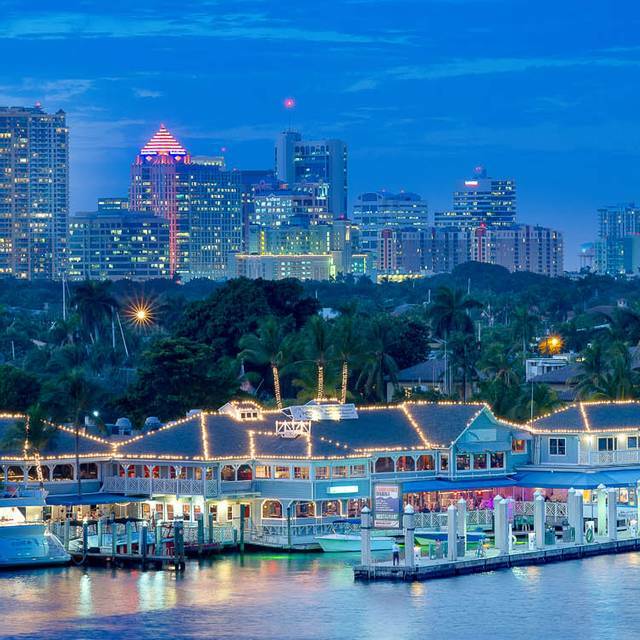 It's one of the most popular outdoor attractions in the entire South Florida region. 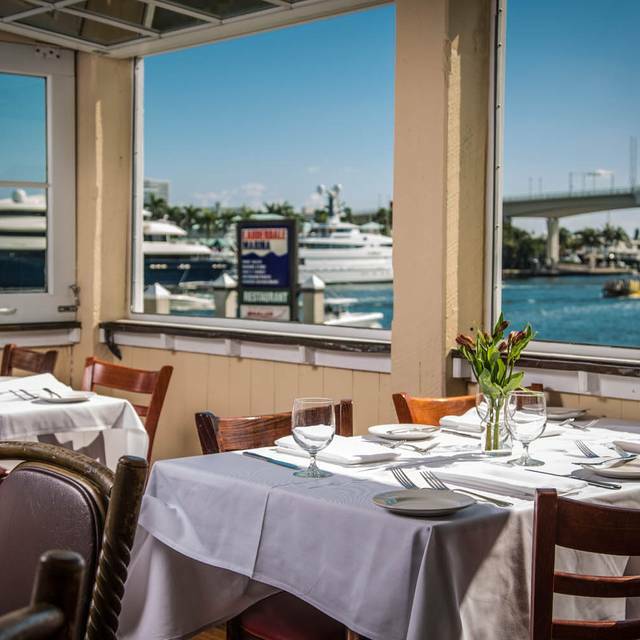 Located above the docks inside historic Lauderdale Marina, the Fisheries is known for offering the freshest seafood and most attentive service, all with the best waterway views in South Florida. 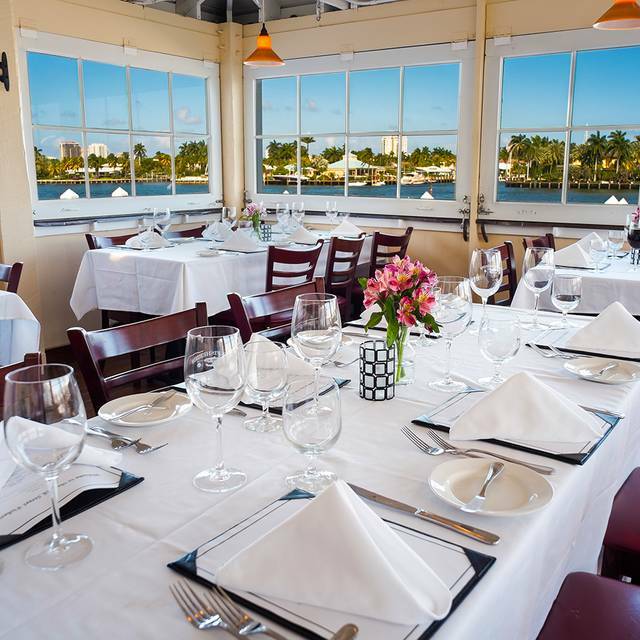 Enjoy fine dining upstairs and casual fare downstairs beside the docks with live entertainment provided several nights each week. Feeding giant tarpon from the marina's docks is a top Fort Lauderdale attraction. The restaurant is also perfect for parties and events, large or small. 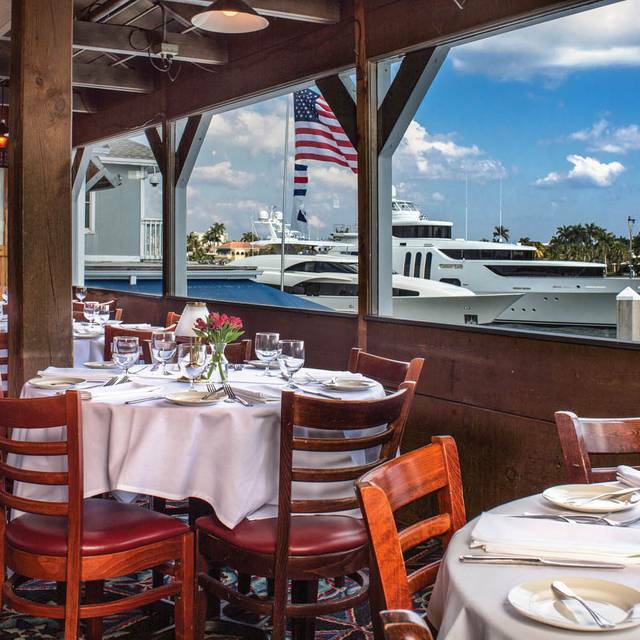 The Fisheries is winner of Gold Coast Magazine's "Best of Broward" award for 2017, voted Best Seafood Restaurant in the county. The 2017 Wine Spectator "Award of Excellence" signifies the seventh consecutive win for the restaurant and its impressive wine list. This menu is served in our upstairs dining room (with reservations accepted) Monday-Thursday 5:00-9:30pm , Friday & Saturday 5:00-10:00pm , Sunday 5:00-9:00pm. What a wonderful dinner. 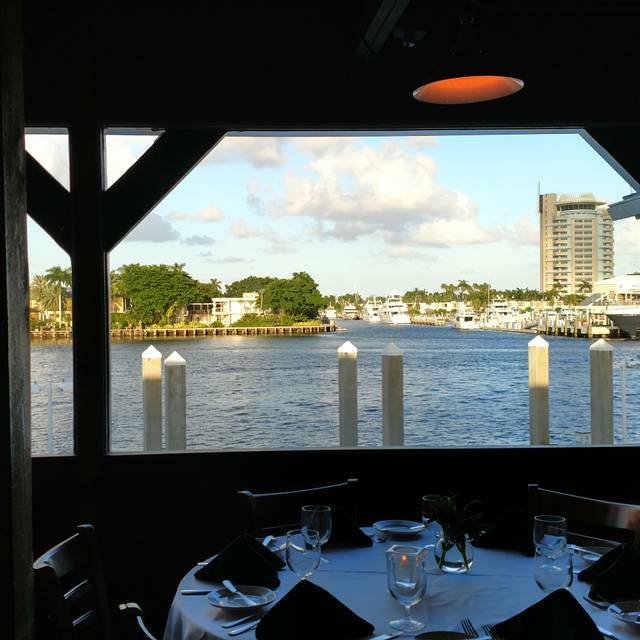 Window seats gave us a great view of the Intercoastal. Aziz and his serving partner(sorry, I have forgotten the lovely lady's name) were exceptional. I had a large group, almost everyone ordered something different, about half the table ordered seafood the other ordered steaks, everyone said that they really enjoyed their meals. Had a dinner with the family. It is a gorges water view from the second floor but that's about it. The service started promptly with the description of the specials and delivery of the bread and drinks after that we were forgotten. When we ordered the food it took about 30 minutes before my soggy, tasteless "Fisheries Salad" came in. Then the main dishes were brought in. My wife's dish "Seared Diver Scallops" were not that good (overcooked), asparagus was limp and not crunchy. My seafood medley "Fruits of the Sea" was just terrible; overcooked, over salted and drowned in some ketchupy tasting source. The other members of the party ordered "Pan-Roasted Grouper " and "Miso Glazed Roasted Sea Bass ", they claimed it was ok. Did not stay to taste the desert. In my view it is subpar overpriced establishment to be avoided. Birthday! We had a great time! Food was amazing, atmosphere and service could not get better! Old FL feel is right. We were upstairs in the "nice" section, the carpets were musty and the table was so slanted I had to keep my drink across from me. I am from Florida but live in Boston, so I KNOW good seafood and am not price shocked if the food is worth it. This place was not even close to good for what we paid. It took a solid 15 minutes to get up to valet to get inside. The hostess was rude, must have also been the same one on the phone that told us there were no openings but then were able to simultaneously book with no problem on Open Table (multiple times showing). The crab cakes were a shredded, over breaded, under seasoned mess. The Rock shrimp salad had two, if that, cut up pieces of shrimp, atop limp, brown edged iceberg, unripe strawberries and it was drowning in dressing. My snapper was great, but it was a VERY small piece of fish - totally underwhelming. My date got the salmon, which was also nicely done, but the accompanying plate of carrot mashed potatoes and the maple glazed whatever, was sticky, overly sweet and just gross. We were very disappointed. From the moment you walk in to the moment you leave the staff makes you feel very important. Excellent food, service and atmosphere. Attentive service, fabulous food, and a gorgeous day made our experience a fabulous one! My wife and I left having a fantastic meal of Maine Lobster, very satisfied and enjoyable! 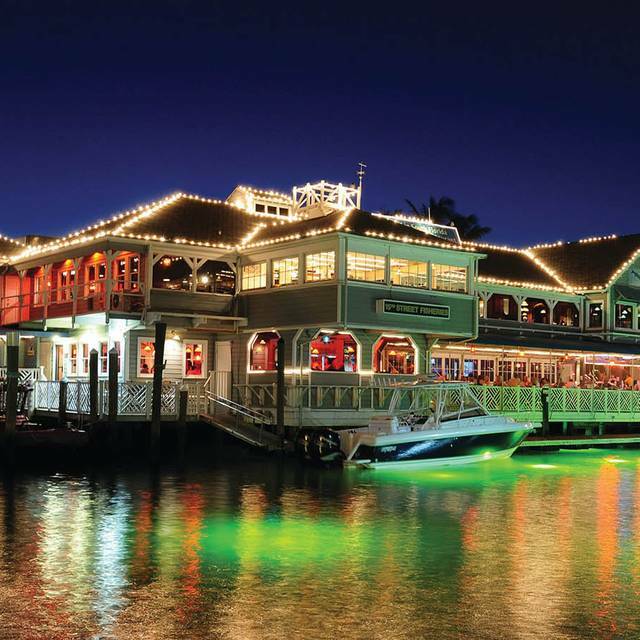 Beautiful restaurant in an outstanding setting right on the water! Service was attentive and the menu was varied. The side dishes were excellent. However, the lobster was over cooked and rubbery. It obviously sat under a heat lamp as the plate was very hot. Great ambience and scenery. The food was magnificent. I highly recommend to Grouper entree. For desert get the Fried Cheesecake. The food and service was great and they went they beyond special when they heard us mention we were celebrating a birthday! We left very full and happy. 15th. Street Fisheries is located right on the water - what a lovely setting. This restaurant serves meals "up" and "down" stairs. The downstairs restaurant is a much more casual setting, people were in jeans, shorts etc, noise volume much louder, there was fun live music playing and the overall setting was more hectic. The upstairs restaurant is much quieter, there are white table cloths on the tables and I suspect the menu prices are more expensive. The plus of upstairs is it is quiet and one can have a nice table conversation with a group, family or couples. The menu was varied and the food was very good. The wait staff was very attentive. 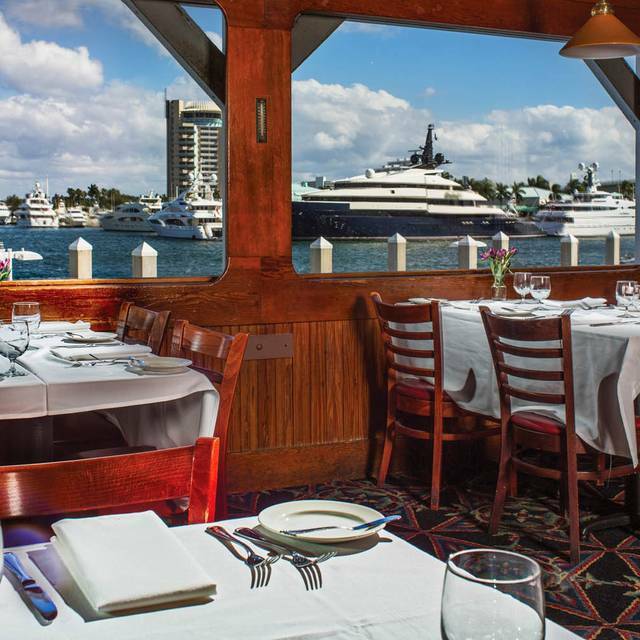 It was a lovely way to enjoy an evening in Ft. Lauderdale with good company, sipping wine watching the large yachts go by as we ate delicious seafood. An added perk-- we took a water taxi to / from our Hotel. As always---fantastic. Food, service, and atmosphere were out of this world. We were in Ft. Lauderdale for a long weekend & saw this establishment on route to our hotel. Highly recommended by everyone we spoke to & would highly recommend to anyone looking for a place for great good, great service & a pleasant ambiance. We dined upstairs which is much more dining then downstairs which is more bar scene. All of our food arrived cold. One dish (a Chilean se bass)was sent back a second time and didn’t arrive until 25 minutes later when everyone else had finished and it ended up being bland. The waiters did their best and were very pleasant but were certainly handicapped by a poorly managed kitchen. Lots of other places to spend your money. Top notch service and the food was amazing. We had the grouper and snapper and would definitely go back! be a little skeptical about the "specials". Our favorite restaurant to visit on spring break year after year. Chilean Sea bass is the best piece of fish ever. Outstanding! Very slow service, but the food was good. Went out for a good meal at a nice restaurant. It was just OK. On the good side, Great view and ambiance. My wife has Celiac's and has to eat Gluten Free. They fed her safely. On the bad side, inattentive service we had to keep asking for water. It was an early reservation - 6:15PM so it wasn't busy, but service was hidden. Foos was just ok and for the price I expected much, much better. I would have been better off eating at home or at Carrabbas as far as the taste of the food. Food was good, company exceptional, service was ok.
Service was very slow—waitress kept telling us our food would be out shortly. When the food arrived after we’d been there one hour the chicken dish my mother had was not edible. My seafood pasta dish had over cooked seafood. We went on St. patricks day to celebrate my mothers birthday. We had a large party in the upstairs level of the restaurant. This area had a tastefully rustic look with views to the water and tarpon feeding by the guests. The food was delicious and the salmon , grouper, and filet mignon are recommended. The service was outstanding! Our server, chris, was friendly, upbeat, attentive, and very patient and professional with our large party. We all thoroughly enjoyed our time there. My friend and me celebrate his birthday last Saturday. When we get to the table there was a birthday card for him. The food was great and the service very good. Excellent dinner with the family. Service was quick and the food delicious. We had a pleasant meal and were well attended to - it did however feel a little bit rushed towards the end with the bill being brought before we had asked for it and without being offered coffee.